CE marking fulfills the requirement of global standard. Breaking Capacity 10 Ka (10000 Amp)MID TRIP Technology. Energy Saving: The low power loss as stipulated In the IEC 898/95, IS /IEC 60898-1. DIN Rail Mounting : Techno MCB's can be mounted on standard 35mm DIN Rail by snap action. Shock Proof : Finger and hand touch safe. Degree of protection IP-20. Protection against electric shock. The housing of Techno of Techno MCB is injection moulded from special grade PBT. It can withstand high temperature and is impact resistant. Contacts are made of special silver inlaid into copper strip, ensuring higher life fand maximum safety against contact welding and erosion. These contacts have low contact resistance resulting in reduced watt loss. The high speed current limiting action ensures that the MCb operate before the full prospective fault current is allowed to develop. Low let through energy as per energy limiting Class 3. And Low Watt Loss. Techno MCB have a quick make & break Trip Free Mechanism. 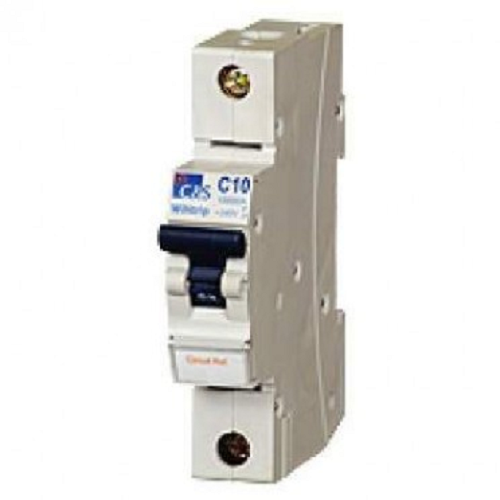 In the event of an over current or short circuit the MCB automatically interrupts all poles even if the MCB toggle is held in ON position,, the handle always indicates the correct contact position.